We chose this cruise as it involved no flying - LA to Hawaii and back. Embarkation very smooth. Seas very rough the first two days (20 ft waves said the Captain) but then spotted out and warmed up for the rest of the trip. Overall staff was excellent, very animated and eager to please. The Star Princess was not overcrowded even though sold out. They kept it very clean. For a ship just out of dry dock though, it had a number of faults. In particular, one elevator dead the whole cruise and a second would not go to the buffet deck. On a cruise with a lot of elderly folks who could not use the stairs this is not excusable. The wife and I did not like the new mattresses - we like a firm one and the new one was like a cotton ball, no back support at all. Food on the whole was good - the two pub lunches were great. But the food seemed a notch down from our last cruise in 2016. The destination experts and speakers were very good. Activities were many and varied going to the islands, seemed to slack off some on the way back. But not nearly as much arm twisting to buy stuff as on our Panama Canal cruise. Shows were good but not great - except for the really fantastic magician. Shore excursions were fine - swimming with sharks was awesome! Snorkeling in Maui we saw lots of fish and even some whales. I can see why we met several people who said they had done this cruise many times. Swimming with sharks off Oahu North shore. We chose this cruise as it involved no flying - LA to Hawaii and back. Embarkation very smooth. Seas very rough the first two days (20 ft waves said the Captain) but then spotted out and warmed up for the rest of the trip. Overall staff was excellent, very animated and eager to please. The Star Princess was not overcrowded even though sold out. They kept it very clean. For a ship just out of dry dock though, it had a number of faults. In particular, one elevator dead the whole cruise and a second would not go to the buffet deck. On a cruise with a lot of elderly folks who could not use the stairs this is not excusable. The wife and I did not like the new mattresses - we like a firm one and the new one was like a cotton ball, no back support at all. Food on the whole was good - the two pub lunches were great. But the food seemed a notch down from our last cruise in 2016. The destination experts and speakers were very good. Activities were many and varied going to the islands, seemed to slack off some on the way back. But not nearly as much arm twisting to buy stuff as on our Panama Canal cruise. Shows were good but not great - except for the really fantastic magician. Shore excursions were fine - swimming with sharks was awesome! Snorkeling in Maui we saw lots of fish and even some whales. I can see why we met several people who said they had done this cruise many times. Cabin was spotless. Much larger balcony than I had ever seen. Having USB ports in the bedside lamps was a very appreciated feature. Our refrigerator never would make the water cold. Shower microscopic as always but I used the ones near the spa - much bigger. Saw Japanese gardens, waterfalls, plus other local stuff. Ended on black sand beach watching large sea turtles sunning. Jodi K. was an excellent guide. 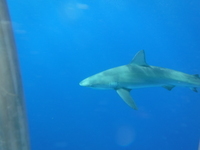 Boat took us off the Oahu North shore to a shark cage. 8 ft long Galapagos sharks were circling. we donned snorkel gear and entered the cage. Sharks came right up to us but not aggressively. A great time! Nice boat ride, excellent singer. Impressive canyon, but not very long. Saw lots of fish, and some whales and dolphins.